Since the 1990s, there has been a tenfold or 1000-percent increase in autism. 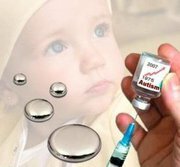 This increase in reported autism cases eerily parallels the increase in the number and frequency of thimerosal-containing vaccinations administered to infants. Thimerosal is a preservative used in many vaccines, and contains about 50 percent mercury. Despite removal of thimerosal from many childhood vaccines, it is still routinely added international to some formulations of influenza vaccine administered to infants, as well as to several other vaccines administered to older children and adults. The biggest problem with all of this is calling it autism. The government was brilliant in coming up with a diagnosis that so mirrored mercury poisoning and vaccine injury so it could be debated until the cows come home and no one will ever have to take responsibility so the immunization program could continue on and on. If everyone who felt their child was truly vaccine injured stopped called their children autistic but rather vaccine injured, we would be in a much different place. There is too much to debate where autism comes from. But there is no debate of where a vaccine injury comes from. We need to call this epidemic what it is, massive vaccine damage to our children. We need to point out the exceptionally high infant and child death rates in the USA as compared to the rest of the similar advanced countries. It is amazing that our child (up to 5 years of age) death rate is 6.7 per 1,000 whereas Singapore has a rate of 2.5 per 1,000. That is 4.2 more deaths in the USA per 1,000 and we have about 4.25 million births a year. Multiply it out, then get angry and call your congressman. The numbers make the world trade center disaster seem small by comparison. Note also, that the child death rate is also quite high for higher income white families which proves that it is not lack of food or access to medical care that is causing this high death rate. We need answers and we need them immediately. Certainly, our CDC knows what these children are dying of, either infectious diseases indicating the vaccines are not working or neurological illnesses (seizures, asthma, etc.) indicating the vaccines may be trading one type of illness for another. No matter, this issue needs congressional attention and we need the facts.